Rating of the most expensive Ukrainian brands made popular Ukrainian weekly magazine Focus. The first three places divided between Nasha Ryaba, Roshen and Chernigivske. It means that food preferences of Ukrainians are chicken, chocolate and beer. In particular, TM Nasha Ryaba becomes leader of the ranking for the third year in a row. This is primarily due to the reasonable price of chicken compared to other types of meat. Revenues of “Nasha Ryaba” increased by a billion hryvnia for one year. This is due on the one hand increased production by 7% and the expansion of logistics, which already has more than 2,600 franchised outlets, on the other - the growth of the chicken prices by 10% in the last year. Thus, by the end of 2011 "Nasha Ryaba " brought to the company 5.1 billion UAH. Not give up their positions the largest sweet brand, the brainchild of the Minister Poroshenko, TM Roshen: its sales increased nearly by 1 billion hryvnia to $ 4.54 billion UAH. This year, in the top ten we can find two beginners: TM Hlibnyi Dar and TM Rogan with the result of sales 1.372 billion UAH and Rs 1.273 billion UAH respectively. With their appearance in the Top 10 now it includes three vodka and three beer brands. By the number of brands represented on the list, most of the positions owned brands under which the produce strong alcohol - they are 10th of 50. 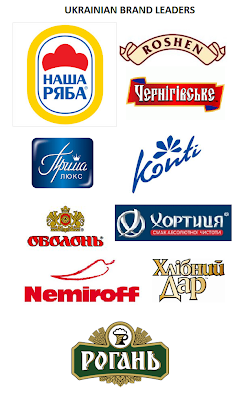 Leader in the alcoholic beverages by sales in Ukraine was TM Khortytsya. This year she managed to overtake Nemiroff brand. 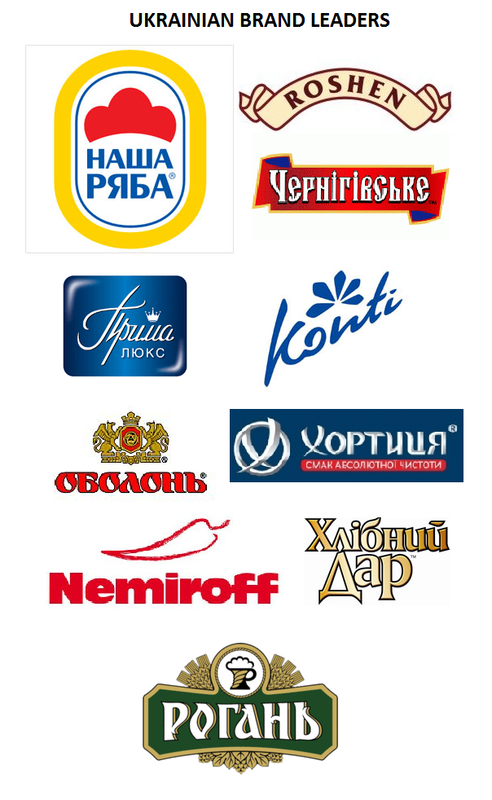 In preparing the rating was assessed only brands by Ukrainian manufacturers, as well as trademarks, developed or acquired by foreign companies, especially for Ukraine. Brands were ranked in terms of retail sales in the country by the end of 2011. It is worth noting the constant growth "admission" ticket rating. So, in 2010, sales were lower boundary of 50 million UAH, in the past - 150 million UAH, and this year - already 230 million UAH.